This small family run bed and breakfast hotel sits on the southern fringes of Staines close to Laleham. Thorpe Park Theme Park is just a mile away. If you are hoping to visit Thorpe Park Theme Park in nearby Chertsey then this is an affordable little option just a mile or so from Staines. There are loads of first-class rides and attractions at the park including the notorious 'Colossus', Nemesis Inferno, Tidal Wave, Stealth, SAW - The Ride, The Swarm and Rush. In addition to the roller coaster action there's also no shortage of events staged in and around the park throughout the year including regular club nights (organized by the Ministry of Sound) and live bands. There's a bus service to and from the park every 40 minutes. The Thameside single and double bedrooms are clean, comfortable and furnished and decorated to a reasonably high standard. It's not a large property by any means, but if you are on a tight budget and like a homely, intimate approach to lodging then its ideal. Each room comes equipped with a breakfast bar, kettle with tea and coffee capabilities and fridge. There are also some lovely Thames-side walks to be enjoyed immediately outside the property. 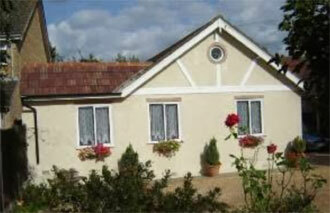 Conveniently situated for the M3, M4 and M25 motorways, and Thorpe Park. Heathrow Airport is a 10 minute drive away and trains to London Waterloo run regularly from a local station.